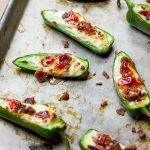 These bacon goat cheese jalapeno poppers are a fast and delicious little appetizer full of creamy goat cheese, crisp bacon crumbles, and sweet pepper jelly overtop quickly charred jalapenos for the perfect sweet and spicy party treat! When my mom and I get together, we usually end up cooking new recipes. It’s what we do. And if we don’t get that far, it’s only because we are still trying to figure out all the ingredients and steps we would need to pull off our latest recipe idea. We always grew up with the family ending up in the kitchen, no matter what the occasion. And this past weekend, there was no special occasion except that we were hanging out with each other and we were hungry. After a big day of demo-ing the upstairs of our house, we were definitely more than hungry, so my smart momma suggested jalapeno poppers. 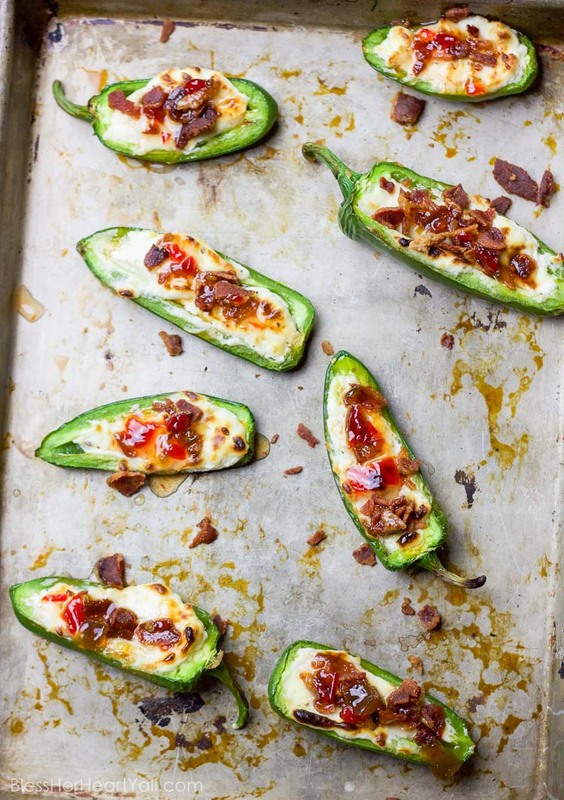 Then the bacon goat cheese jalapeno poppers were born! 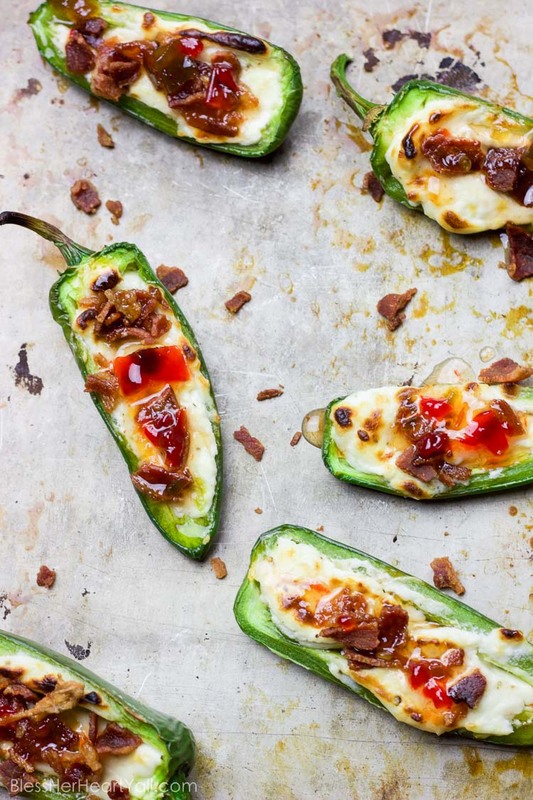 We started these bacon goat cheese jalapeno poppers with a mixture of goat cheese and cream cheese spread, sprinkled in some garlic and onion, and then broiled them until the peppers started to crisp. Then we crumbled some crisp bacon crumbles on top and finished it all off with a sweet pepper jelly for a sweet and spicy combination that couldn’t be any easier to make while hosting others who are just a bit hungry! For the jalapeno jelly that tops this recipe, you can purchase it at most groceries stores (I find it by the fancy cheeses and meats by the deli) or easily make your own. I highly recommend I Wash You Dry’s pepper jelly recipe! Preheat your broiler to high. 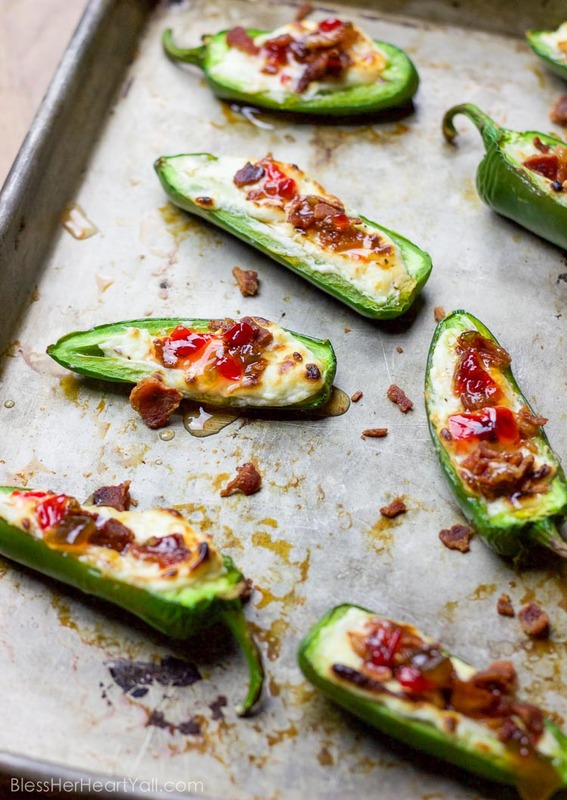 Place the jalapeno halves on a baking sheet with four sides. Fill each pepper with the mixture of cream cheese, goat cheese, onion, garlic powder, and salt. Broil for 7 minutes or until the peppers start to crisp and brown around the edges. Remove from the oven and sprinkle with the bacon crumbles and finish with a drizzle of the pepper jelly. Enjoy! OMG, These look delicious!! I’m going to have to make them soon! I’m so in love with goat cheese these are definitely something I need in life.